Though long-associated with violence, the Caucasus is a region rich with religious conviviality. 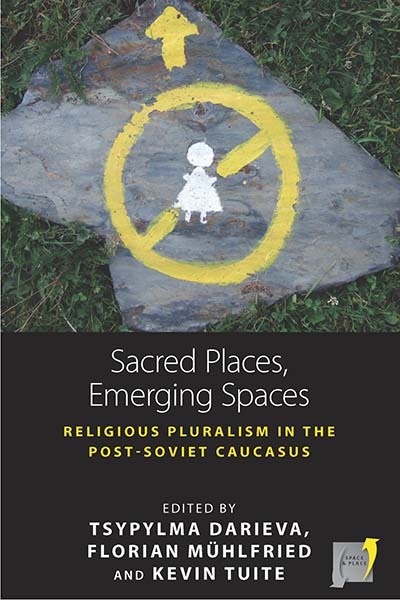 Based on fresh ethnographies in Georgia, Armenia, Azerbaijan, and the Russian Federation, Sacred Places, Emerging Spaces discusses vanishing and emerging sacred places in the multi-ethnic and multi-religious post-Soviet Caucasus. In exploring the effects of de-secularization, growing institutional control over hybrid sacred sites, and attempts to review social boundaries between the religious and the secular, these essays give way to an emergent Caucasus viewed from the ground up: dynamic, continually remaking itself, within shifting and indefinite frontiers. Tsypylma Darieva is a senior research fellow at the Centre for East European and International Studies (ZOiS) in Berlin and is teaching at Humboldt University Berlin. Her research and teaching interests include anthropology of migration, diaspora and homeland, urbanity, and sacred places in Central Eurasia. She has conducted fieldwork in Azerbaijan, Armenia, Kazakhstan, and Germany. Darieva is the author of Russkij Berlin: Migranten und Medien in Berlin und London (LIT, 2004), co-editor of Cosmopolitan Sociability: Locating Transnational Religious and Diasporic Networks (Routledge, 2011), Urban Spaces after Socialism: Ethnographies of Public Places in Eurasian Cities (Campus, 2011) and of the forthcoming volume Sakralität und Mobilität in Südosteuropa und im Kaukasus. Florian Mühlfried is a social anthropologist in the Caucasus Studies Program at the Friedrich Schiller University of Jena. Previously, he was a research fellow at the Max Planck Institute for Social Anthropology and a visiting professor at UNICAMP, Brazil. He has published the monograph Being a State and States of Being in Highland Georgia (Berghahn, 2014), a book on feasting in Georgia (ibidem, 2006), and edited the volume Mistrust: Ethnographic Approximations (Transcript, 2018). Kevin Tuite is Professor of Anthropology at the Université de Montréal. He also directed the Caucasus Studies Program at the FSU-Jena from 2011 to 2014. His publications include Language, Culture and Society: Key Topics in Linguistic Anthropology (co-edited with Christine Jourdan) (Cambridge, 2006).